Looks like the way we drink soda is about to get a whole lot smarter—or, at the very least, more connected. OpenStack Engineering Manager Alavaro Lopez Ortega stumbled across the fact that The Coca Cola Company recently registered no less than 16 million MAC (media access control) addresses. The question is: What exactly is Coke planning on doing with that much networked hardware? Ortega's first thought, as outlined in the above diagram from his blog, leans toward some sort of "live," connected can—presumably ones that would be reusable. But it's hard to see the practicality behind something like that. What's more likely is that Coke has big plans in store for their fancy, touchscreen Freestyle machines. Just a few months ago, Coke told Businessweek about its interest in accepting smartphone payments and tracking user purchases for the purpose of occasional discounts and free drinks—in addition to, you know, tracking for tracking's sake. 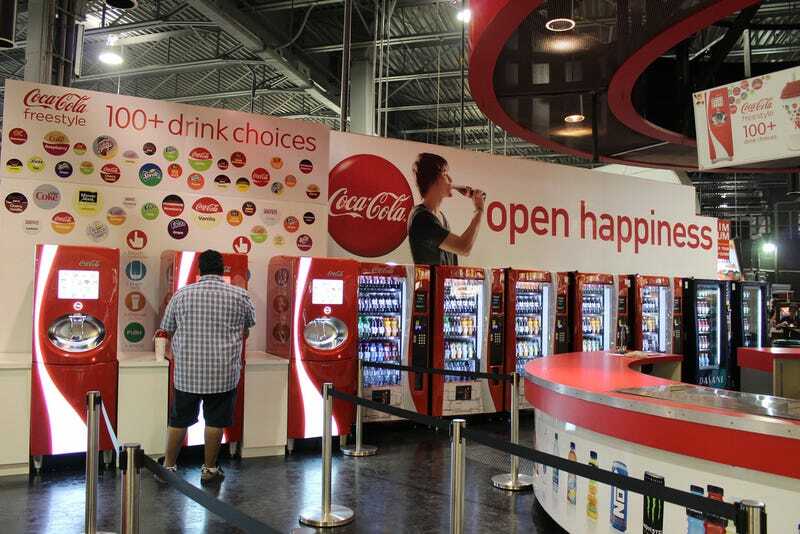 And it certainly make sense for Coke to move to networked vending machines; it would allow them to track inventory and making stocking decisions from afar instead of sending a truck to check on each individual machine. Plus, this would give users the option to use their phones to connect to the vending machines, allowing them to play games for free drinks, connect to a standing account, or whatever else the conspiring minds over at Big Soda manage to dream up.